How to add a short break or cleanup time between appointments. If you need a bit of time between appointments — for cleanup or to check out clients or just to take a breather — Genbook's Buffer feature has you covered. 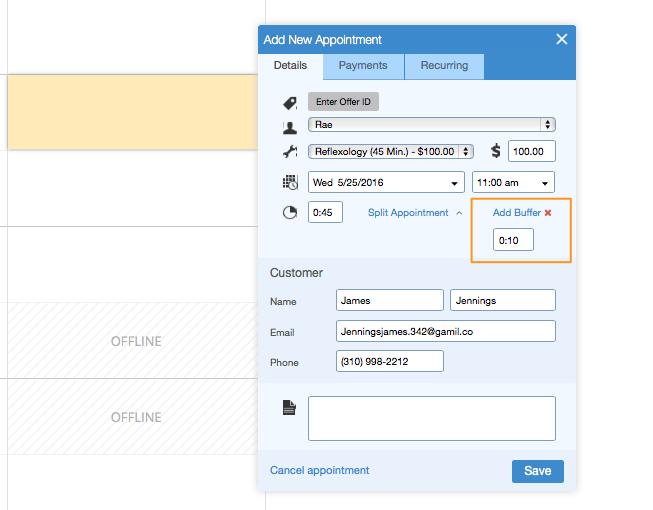 There are several ways to create buffers, the easiest being right on your Service Details page. 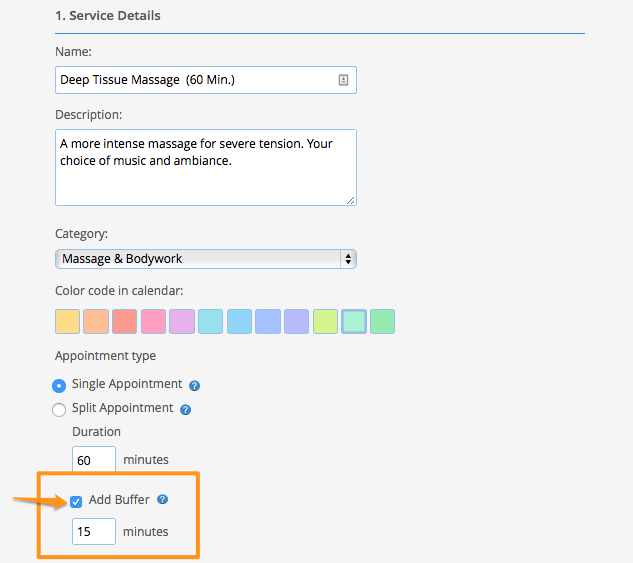 Towards the bottom of the page, check the box beside "Add Buffer", and fill in the amount of time you need at the end of appointments for that service. Remember to save your changes. Once you've added a Buffer to a service, all new appointments for that service will have that extra time tacked on at the end. 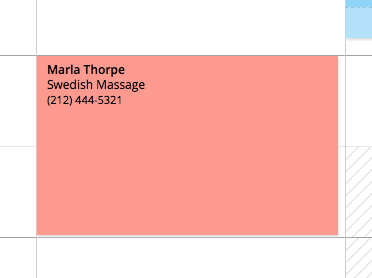 In the above example, we added a 15-minute Buffer to the 60-minute service "Deep Tissue Massage". When "Janice Kelly" booked that service, 15 minutes was added to the end of the appointment in the business's calendar, but on Janice's end the appointment is still only 60 minutes long. 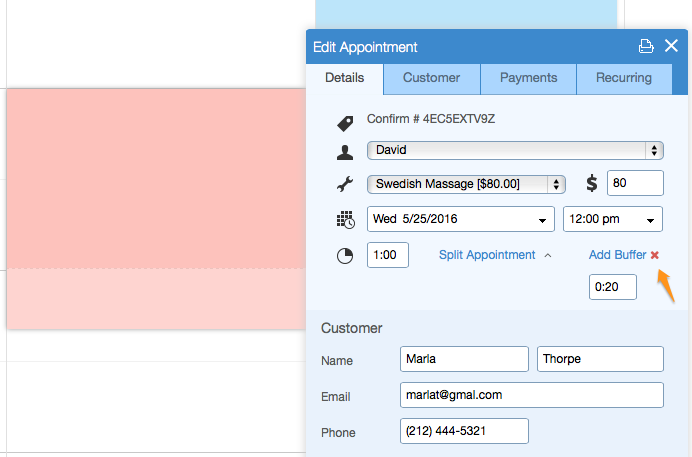 You can also add Buffers to appointments on the fly, when you're booking them manually in your Calendar (Offline). Let's say you don't generally need extra time after a certain service, but you DO like to have a little extra time after appointments with specific customers. On the "Add New Appointment" form, click the up arrow beside "Add Buffer". Then, just enter the length of the Buffer when prompted, and save your changes. The appointment you've just added should now have a Buffer on it. 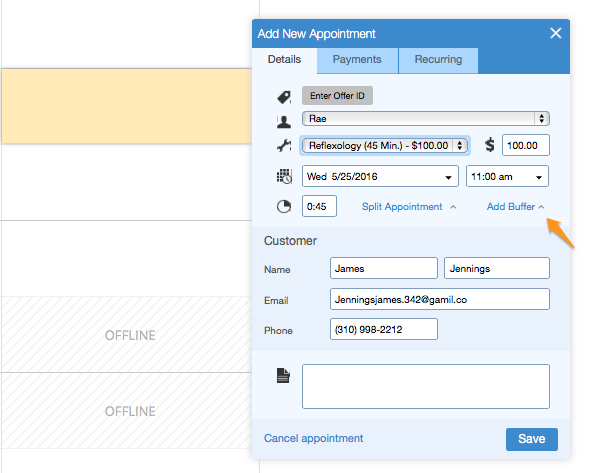 You can also add Buffers to existing appointments, in the same way you would a new Offline one. Just click on the appointment in your Calendar to edit it and then follow the instructions above. 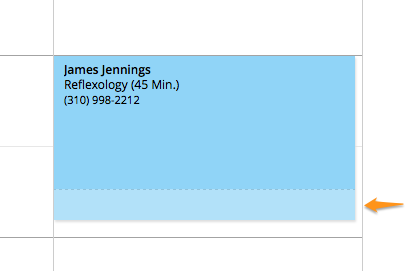 To remove a Buffer, simply click the red "x" beside "Add Buffer" and then save your appointment. The appointment will then only be as long as the service's duration.